Early phonograph records were certainly interesting, but as an artistic medium they left much to be desired—specifically, decent sound. Records played on the first Gramophones sounded as if someone were singing at the end of a long pipe, from inside a sealed box. And, as long as the recordings were made acoustically—that is, mechanically—there wasn't much to be done to improve the quality of the recordings. What was needed, though no one realized it in 1910, was the ability to record through an electric microphone. Sound is a mechanical phenomenon. As I described previously, it is the result of perceiving pressure waves that travel through the air (or another medium, such as water). An old conundrum goes, "If a tree falls in the forest and there's no one there, does it make a sound?" By my definition of sound, the answer would be "No. Sound waves emanate from the fall, but sound requires a creature or device to perceive those waves." As a mechanical phenomenon, sound has certain built-in limitations. It cannot travel in a vacuum, for instance—in space, as science fiction author Harlan Ellison pointed out, no one can hear you scream. Sound also cannot be heard over great distances, and it cannot inherently be heard after the fact—hence the development of the talking machine, which solved the time problem, as well as the distance problem, as long as you didn't mind an enforced time delay. But it did not solve the problem of real-time transmission of sound over great distances. With home-recorded cylinders, you could send voice mail to a loved one in another city, but not have a long-distance conversation. This was not a new problem, of course. The problem of long-distance writing had been solved for millennia, with complex messages sent by courier, or smoke signals, or semaphore flags (good for modest distances only) or signal beacons, such as those seen in The Lord of the Rings. However, because of the complexity of these solutions—and the fact they all require a third party to monitor and receive and interpret the messages—an opportunity was left open for anyone clever enough to invent a new method…perhaps one not based on mechanics. Electricity is not a mechanical phenomenon. Where mechanics involves the movement of molecules of matter in large groups, electricity operates within a much smaller arena, that of the atom. Atoms are composed of a nucleus surrounded by a cloud of electrons, bits of matter so small and light they can actually travel at light speed. Normally, they just whiz around their nucleus. However, when atoms bond to create molecules, they do so by sharing their electrons. And, in the more metallic molecules such as those that compose gold or copper or even carbon atoms, the electrons flow so easily that they are willing to jump from one block of it to another, as long as they are near. That's how extension cords, and electrical plugs and outlets work. But this was unimaginable as little as 500 years ago. While the golden-age Greeks knew of static electricity (the thing that gives you a jolt when you touch metal after shuffling your feet across a carpet), they couldn't think of any use for it. (The Sumerians built galvanic batteries, possibly for electric acupuncture or electro-plating, but their use was long forgotten by the time of the Greeks.) The first battery to produce a large electric current was built by Alessandro Volta, whose name gave us our term for the "punch" of an electric current: the volt. In fact, there are just three terms that, if you know them, make electricity fairly easy to understand. First is polarity. Polarity is either positive or negative. Electrons have a negative charge, and (by comparison) atoms that are short on electrons have a positive charge. A positive charge attracts electrons, so electrons always flow from where there are a lot of them (negative) to where there are few of them (positive) if they can. Next is amperes, named after André-Marie Ampère, another scientist who played around a lot with electricity. Amperes is the measurement of how many electrons happen to be flowing at the moment. Think of it as analogous to the measurement of how much water is flowing in a river. Like the energy in water dropping over a waterfall, voltage is always a relative term—usually relative to the ground, the surface of that great battery, Mother Earth. That's why, when you have two or three wires to connect to a light switch you are wiring, or to an electrical plug, one is always called "ground." That wire is connected, somewhere in your house, to the actual earth on which your house stands. If you, personally, are touching the ground—or a wire touching the ground—you are said to be "grounded." It's an electrical term. If a spike of metal is placed on your roof, and a wire from it is attached to ground, that's a lightning rod (invented by Benjamin Franklin, by the way). Lightning will be attracted to the rod instead of your chimney or the peak of your roof; and because the wire allows the enormous amperage of the lightning bolt to flow to ground easily, the lightning rod protects your house from what otherwise would be a dangerous cause of house fires. The reason that a house may burn if it is hit by lightning (and not protected by one or more lightning rods) is that, unlike the wire connecting a lightning rod to the ground, a house is not a good conductor of electricity. A good conductor is something that allows electricity to pass through it without reducing the electricity's voltage in the process. Gold and copper are excellent conductors, which is why we use them in wires to connect high-end electronic and electric components. Wood and brick are poor conductors. And anything that lowers voltage, emits heat in the process. So if lightning strikes an unprotected house, the wood or bricks that lie between the strike and the ground will get so hot as they lower the lightning's very high voltage that they will explode in a shower of flame and sparks. With these three concepts, you can understand any of the other words you hear about electricity. For example, watts—named after James Watt (the one who contributed to the development of the steam engine, not Ronald Reagan's Secretary of the Interior)—are simply calculated by multiplying volts times amperes. And AC—alternating current—is an electric current whose polarity switches from positive to negative many times per second. (In the United States, that's usually 60 times per second). DC, direct current, flows instead at a constant polarity. There's just one more aspect of electricity you need to know before you would be ready to live in the nineteenth century and try to invent the microphone, and that's the fact that electricity and magnetism seem to be related somehow. (In the 20th century, that relationship was finally understood so that we now speak of electro-magnetism as a single force of nature.) If you make a coil of wires—that is, you wind a long wire around and around a tube, being careful to lay each loop of wire precisely adjacent to the one before it—and move a magnet back and forth within the tube, you will actually create an electric current in the wires. (That's the basis of the generator.) And, if you run a current through the wires and place an iron rod inside the tube, you will magnetize the rod! A microphone, to change the mechanical energy of sound into some kind of electrical equivalent. A transport system, to get the electrical energy from the source to the destination. 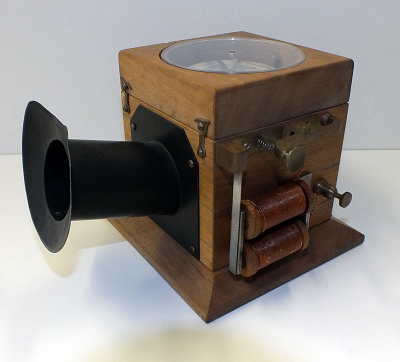 A loudspeaker, to change the electrical energy back into the mechanical energy of sound, so the receiver could hear it. I am, of course, using the modern terms for these components, since the words did not yet exist with these meanings. Reis' original idea was to use a rubber diaphragm as a switch for both microphone and speaker. 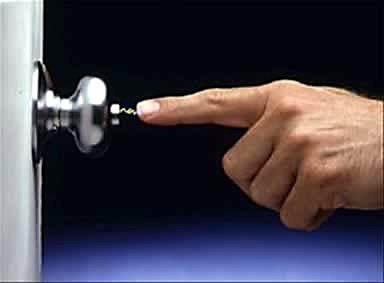 He thought that if a very sensitive switch were attached to the diaphragm, so that sound waves would cause the circuit to be broken and reestablished thousands of times a second, the electricity would spark at the other end, causing the receiving diaphragm to vibrate and reproduce the incoming sound. This didn't work, of course; it was impossible (at the time) to create such a delicately sensitive switch. But Reis then tried taking advantage of electricity's magnetic properties. He attached a slim magnetic rod to the diaphragm and allowed it to move freely within a tube of tightly wound wire. When sound hit the diaphragm, the diaphragm made the rod vibrate back-and-forth, which set up an alternating current in the wires. When this current reached the receiver, the alternating magnetic field caused the rod to vibrate back-and-forth, which forced the diaphragm up-and-down, which recreated the pressure waves of the original sound! And it was an elegant invention, too, with its single device that could act as both microphone and speaker. It was demonstrated all over Europe, including once in Scotland at the same time that Alexander Graham Bell was there, visiting his father. The telephone was invented. So Bell had to start from scratch, and he decided that the microphone ("mouthpiece") and loudspeaker ("earpiece") should be different devices. Emile Berliner, the same guy that invented the disc Gramophone, is credited with having invented the first microphone, since he patented his invention. However, it wasn't very useful. Working on a different design, Bell's is considered the first useful microphone (although it's very similar to one patented by Elisha Gray just two hours after Bell patented his! 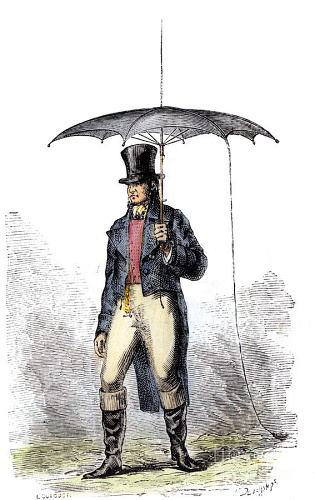 —Which, of course, invalidated Gray's patent). In this version, a constant source of electricity (a battery) provides a steady current that passes through the coil of wires. The diaphragm makes the magnetic rod vibrate with the sound. But, this time, the rod is fighting the magnetic field set up by the steady current running through the coil. This fight has the effect of modulating the voltage of the current in exact lock-step to the pressure waves of the sound hitting the diaphragm. 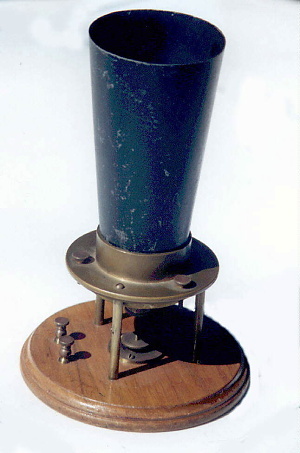 The loudspeaker was made up of a standard megaphone with a rubber diaphragm at its narrow end, just like the one used in a Gramophone. However, a magnetic rod was attached to the diaphragm instead of a phonograph needle; and that rod was inserted into a coil. When the fluctuating current arrives from the microphone, the rod vibrates, making the diaphragm vibrate, recreating the sound waves which are then amplified by the megaphone horn. And that still wouldn't have been a successful telephone if Bell hadn't been such a terrific entrepreneur. He tried to sell his patents to the Western Telegraph Company (a "speaking telegraph" seemed a likely improvement for them) but they referred to it as "a toy" and refused to buy. Still, Bell never lost faith. And when he demonstrated the telephone at the Philadelphia World Exhibition in 1876, it proved to be a hit and the investors lined up. 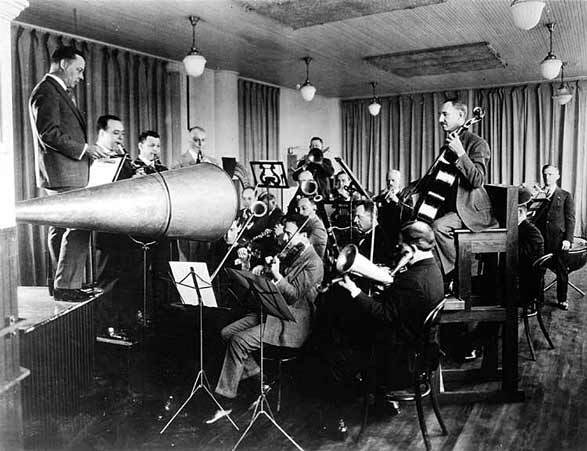 Nevertheless, by 1924, when hundreds of homes had telephones, record players still relied on mechanical sound reproduction and all music recording was accomplished similarly, with performers singing and playing as loudly as they could into a giant megaphone that drove a needle into a master disk. That changed in 1925, when a device was developed that could convert the electrical signal from a microphone, not into sound, but into the wobbly lines inscribed by the needle onto a record master. Its inventors hoped this system would produce sound as good as that made by a direct transcription from an acoustic horn. Instead, it turned out to be much better. The patents were jointly owned by Victor, Columbia and HMV Records, who refused (at first) to share it, of course. The era of electric recording had begun. By 1926, some companies without access to the new microphones, such as Odeon in Europe, advertised on their record sleeves and catalogs that their recordings were electric, even though they were not; record buyers insisted on it. By 1927, the patent owners capitulated, finally realizing there was more money to be made selling microphones than by trying to corner the recording market. The process of making records electrically then remained essentially the same for the next several decades. Recording artists would gather in the studio with their instruments and sheets of music. Because the intensity of sound from the double bass caused the cutting needle to jump out of the groove, it was replaced by the tuba. Special violins, called Strohs, with built-in acoustic amplifiers were used in place of the standard instrument. The orchestra would be seated on bleachers, at first gathering around the recording horn, then (after 1925) the single microphone. Although the microphone had a volume control, that was the only control the recording engineer had. The singer or singers would be placed just in front of the horn or microphone, learning to "pull back" for particularly lusty passages so the needle wouldn't jump the groove with excessive volume. The recording was made directly onto the master, a wax platter. There might be several "takes" but each one had to run from the beginning to the end of the piece—there were no "cuts" because such a thing wasn't technically possible. The performers had to take care to not exceed the four-minute time limit of a ten-inch disk. After the recording, the wax master of the selected take would be electroplated, and an inverted "matrix" pressed from that. This matrix had squiggly ridges where the grooves of the original wax master were. From the matrix could be pressed some number of "mothers" (typically ten) made of a much sturdier material than that of the wax master. The mothers, as negatives of a negative, had grooves that matched those of the original wax master. And from the mothers, would be created "stampers," each of which could press grooves into up to 1,000 shellac records. All these steps were needed because of the fragility of the original wax master. Before 1925, records weren't always recorded at 78 rpm (revolutions per minute). In practice, the speed of each platter differed from others, from perhaps 64 rpm to a heady 92 rpm or more. The speed was sometimes specified on the record label, sometimes not—and even when it was, some records labeled 78 rpm may in reality have been recorded as slowly as 72 rpm! The clockwork record players of the day permitted infinite adjustment of speed but it was anybody's guess just what speed was "correct." The user had to make adjustments by ear. By 1925, the speed had standardized on just over 78 rpm, derived from the gears used and the growing use of electric motors to turn the disks during recording, even if not in playback. Indeed, the fact that most record players were wind-up affairs that didn't require electricity may well have contributed to the survival of the medium. Because other improvements in electronics in that same year—1925—turned broadcast radio from a curiosity to a commercial success. And radio, which used not only electric microphones but also magnetic loudspeakers and played music by live orchestras, nearly swamped the record business in popularity. I believe it was the fact that a portable, wind-up phonograph could be brought along to the beach or on a picnic or to one's remote vacation home was the primary reason that people continued to buy records, especially after the start of the Great Depression in 1929, which was the all-time nadir for the record business. And, unlike the equipment of today, record players were made to last, portables no less than cabinet units. —So much so, that when I was seven (in 1958) I was given a cabinet Victrola that played perfectly, and which provided me with almost constant music for the next three years. 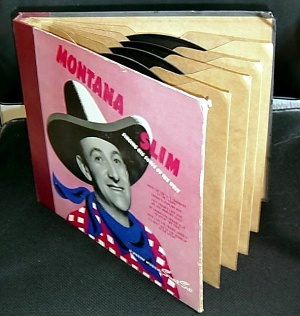 78s were sold singly, packaged in flimsy paper sleeves that provided a minimum of protection, and in albums composed of five or ten sleeves and constructed similarly to photo albums of the time; hence the name. (The term "record album" came to mean a collection of songs, which is why when long playing records were introduced, people called them "albums" even though they usually consisted of just one disk.) The very first 78s were recorded on just one side, but two-sided discs soon overshadowed the one-sided variety in the marketplace. Manufacturers experimented with a number of different materials for 78s. Edison's disks even included a layer of crushed stone! But they finally settled on "shellac," a pre-plastics substance derived from the excretions of a bug from India. The shellac formed the two surfaces of a disk, pressed against a filler. The shellac itself was usually mixed with lampblack, which gave it a black color as well as improved sound quality; but sometimes another dye would be used to create a "colored" record—red or brown or blue—to catch the consumer's eye. 78s were still being manufactured in the United States when I was a kid. By then some were made of vinyl or another plastic, which had a quieter surface but couldn't stand up to the weight of a typical 78 record player tone arm. They continued to be sold in India into the 1960s, where lack of electricity in rural areas guaranteed a market of Victrola-owners. 78-rpm Beatles records from India are among the most sought-after Beatles memorabilia. But by the 1960s the world had embraced a throw-away approach to technology, and the 78's days were numbered. In the next segment of this series we'll look at the 78's replacements: the 45 and the LP.